Did you know the fonts on your system can look like this!? Just click the font menu to discover the world's easiest way to add excitement to any page! Did we say easy? No disrespect, but we tested Wow'em on our own bosses. They were amazed at what they could do with the programs they already know. The only coaching we gave them was "Just select your headline and change the font to one of these 'Wow' fonts." They tried, they saw, and they said "Wow!" So, what is Wow'em? Wow'em is a collection of TrueType™ fonts (PostScript™ also available) that have all kinds of professionally-designed colors and effects built in to the font. 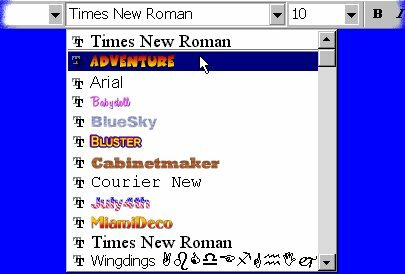 Since Wow'em fonts are TrueType, they work with the vast majority of existing software and hardware. Our logo on the left was rendered in 10 seconds using Microsoft Word™ by typing the word "Wow'em" in the WowBrite font. Let's see 'em! Wow'em font designs range from showy to stuffy, so they're suitable for just about anything. Here are a few samples that our users showed us, though the entire font collection is much more extensive and growing constantly. But...? See our Marketing FAQs and Tech FAQs for the answer to that. The 75 fonts shown on this website plus rendering plugin software cost $199 for a single CPU license. Specify MacOS or Windows. California shipping addresses must include sales tax. You can create your own color fonts using Wow'em Designer, also available from Wow'em. Please call for pricing.